The University of Virginia recently participated in a test deployment of Schlage modular wireless locking systems, according to SecurityInfoWatch. 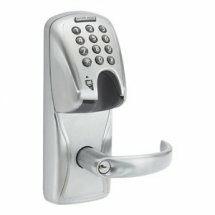 The university tested Schlage’s ANSI compliant AD-4000 wireless locks with dual credentialing, which allows students to use their campus issued ID card and a unique PIN to access residence halls and rooms. And because the locks are online and wireless, school officials have the ability to update access control permissions and create immediate lockdowns. The student’s card, once swiped, is read, sent to server and the server comes back with a pass or fail. If the network connection is lost or the server is unavailable, a local copy of the patron access assignments is retained on the lock and multi-door controller. In the event that power is lost to, the AD-400 lock limits access to the last 1000 cards presented and allowed access through the door. The modularity of the AD-Series locks allows the university to easily remove and replace the magnetic stripe reader module with a smart credentials reader, for future plans and such.